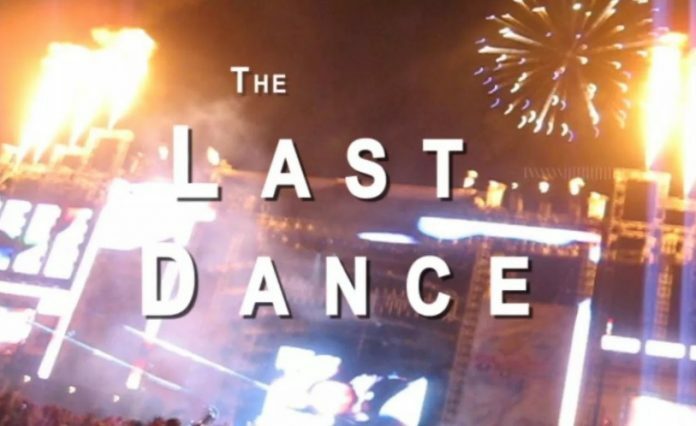 THE LAST DANCE is streaming free on Vimeo and YouTube. This feature-length documentary highlights one of the most critical periods of the electronic music and harm reduction movements in the United States. 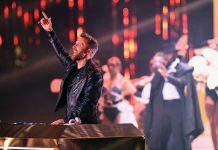 Over the past decade, electornic dance music has erupted into a global industry where its artists rank as top grossing entertainers and attract live audiences the size of cities. While MDMA – aka “Ecstasy” or “Molly” – has remained the number one party favor for participants, the culture continues to struggle with MDMA and other drug-related fatalities in cities such as Los Angeles, Las Vegas, Dallas, New York, Chattahoochee Hills (Georgia), Boston, and Washington, D.C.
How have agencies and bureaucracies responded to these issues? Do local communities value the presence of large-scale dance massives? To address substance use at EDM clubs and festivals, are authorities willing to try new and unprecedented strategies? THE LAST DANCE captures one of the most influential events in the recent history of America’s dance scene, taking you from the height of MDMA consumption at the end of the 1990s to the federal passage of the R.A.V.E. Act, and culminating in a weekend in June of 2010 surrounding Electric Daisy Carnival at Los Angeles Memorial Coliseum. With a reported total attendance of 185,000 fans at the stadium grounds next to Univ. of Southern California, what started as a two-day celebration of DJs and late-night beats ended in an explosion of headlines describing chaos, disaster, and tragedy. On every local paper, TV channel, and radio station, parents were warned of overdoses, violent crowds, and ultimately the death of a 15-year-old girl who had allegedly taken MDMA. 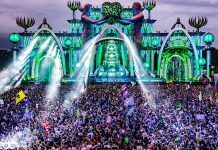 The news shocked Los Angeles and served as the first case in the U.S. in which a minor died as a result of collapsing at a commercial EDM gathering. 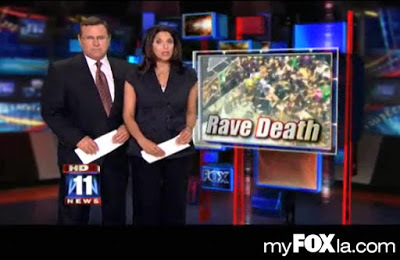 Almost overnight, it became the most publicized rave-related mortality of the post-R.A.V.E. Act era. 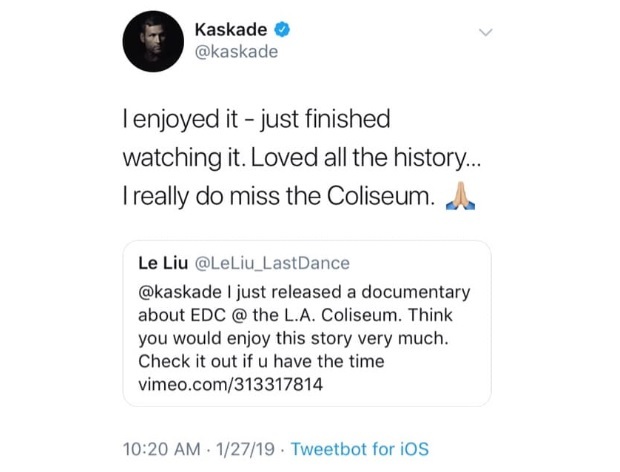 The relationship that the Coliseum had been building with Insomniac, Inc. – the company behind EDC – and other dance event organizers since 1997 was now in jeopardy. 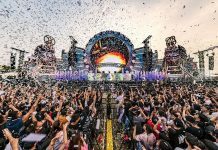 The controversy reignited a national debate on the dangers of raves, and initially introduced the familiar question of whether these gatherings should just be stopped altogether. However, EDC 2010 would eventually prove to offer a different type of discussion and reveal that the stakes at hand were far more complex than a matter of banning vs. not banning the parties. Rather than employ a police crackdown – which is what nearly every local government had done in the past – Los Angeles made a set of moves that had never before been seen in this country. The ground-breaking response from L.A. County implicated 2010 as a turning point for electronic music massives within mainstream society, and signified an institutional shift beyond the traditional criminal justice approach towards drug policy. THE LAST DANCE is about the end of an era which brought forth new beginnings. It is the true-life tale of a web on the brink of implosion. An insider’s view of a network of ravers, promoters, DJs, journalists, doctors, and politicians during the summer and fall of 2010. It is the story of everything that was done to stop events such as Electric Daisy Carnival at the Coliseum. And a story of everything that Los Angeles did to fight back.